Elimination of external vibrations plays a key role in maintaining a stable growth process and maximizing the total volume yield of very large crystals. Jim McMahon reports. At Kansas State University, a facility is dedicated to the research and development of new and innovative radiation detector technologies. The Semiconductor Materials and Radiological Technologies (SMART) Laboratory is the largest university-based radiation detection laboratory in the country. It focuses on the detection of neutrons and gamma-rays, primarily those from special nuclear material (SNM) for homeland security applications. SMART Lab investigates and fabricates a variety of detectors which include compact low-power neutron detectors, high-resolution room-temperature-operated semiconductor gamma ray spectrometers, pixelated devices for gamma ray or neutron imaging, and miniaturised gas-filled detectors. The laboratory builds detectors from start to finish in readily deployable packages for use in better securing borders from nuclear materials such as plutonium and uranium. The gamma ray detection aspect of the laboratory's research is focused on the discovery and development of new dense, high-Z* semiconductor materials, such as cadmium zinc telluride (CdZnTe or CZT) and mercuric iodide (HgI2), and several scintillator materials including lanthanum tribromide (LaBr3) and cerium tribromide (CeBr3). Research conducted on large crystal growth with high-Z semiconductor and scintillator materials has produced large crystal ingot yields. Gamma rays are electromagnetic radiation of high frequency (very short wavelength), that are produced by sub-atomic particle interactions such as electron-positron annihilation, radioactive decay, fusion and fission. Gamma radiation is highly penetrating photons, extremely energetic. To directly detect them is very difficult, however - a material with a high Z number is needed, representing a high number of neutrons and protons in the nucleus. Those nuclei tend to stop gamma rays much better than other elements such as hydrogen or helium, for example. A crystal with a high-Z number converts the gamma rays from electromagnetic waves to excited electrons. The electrons move through the crystal or create light, one or the other, and produce something that is possible to be detected. If a crystal is very uniform, very homogeneous - it can be determined that a gamma ray interacted in the crystal by the effect that is observed in it. At the SMART Laboratory, crystals of CdZnTe and the scintillator materials are grown via a vertical Bridgman furnace. In this process, molten material is directionally solidified from one end to the other to produce a large-volume ingot that is a single crystal. Methods to grow CdZnTe for gamma-ray spectrometers have been explored since the early 1990s, yet a reliable system to produce large crystals at an economical cost has not been achieved until relatively recently. Higher ingot yields enable smaller, faster and more accurate sensors, and allow gamma-ray detectors to be more economical and field-portable - benefits that can have a significant impact on national security objectives. Radiation detectors using CZT can operate in direct-conversion (or photoconductive) mode at room temperature. Essentially, SMART Lab researchers encapsulate the material to be grown inside of a quartz ampoule under vacuum. 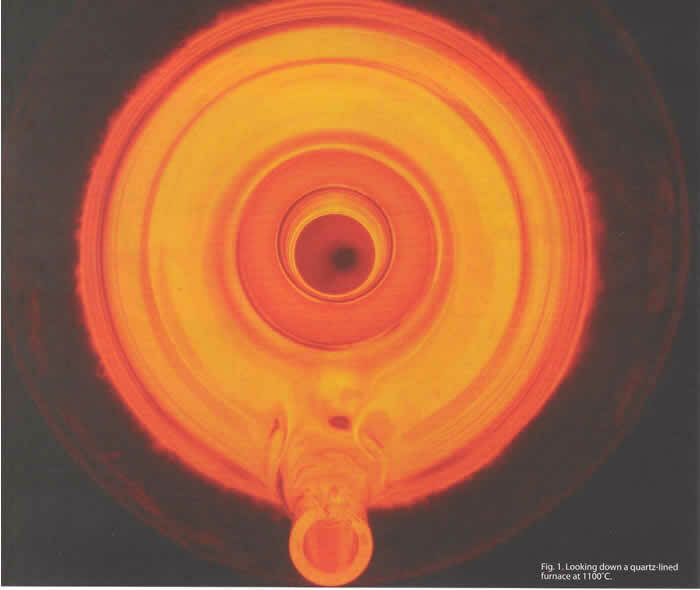 The quartz tube is put inside the furnace vertically bringing the material to a molten state between 500° - 1100°C. Then they very slowly freeze the material from bottom to top. If the thermal gradients are correctly performed, a large crystal will develop. Once the crystal is grown, it is extracted from the tube, trimmed to size with a diamond wire saw and polished to produce a detector. Critical to maximizing ingot yield is maintaining a stable crystal growth process through the elimination of external vibrations. "The general consensus within the crystal growth community is that uncontrolled vibrations can destabilize the growth interface," says Professor Mark Harrison with SMART Lab. "As the material is freezing from bottom to top, there is an interface between liquid and solid, and it sets up a natural convection flow that is ideal for growing a big, single crystal. If a vibration disturbs the liquid directly above the forming crystal solid, it can change the convection patterns and multiple crystals will form from the previous single crystal. Which is contrary to our purpose of growing large, single crystals." 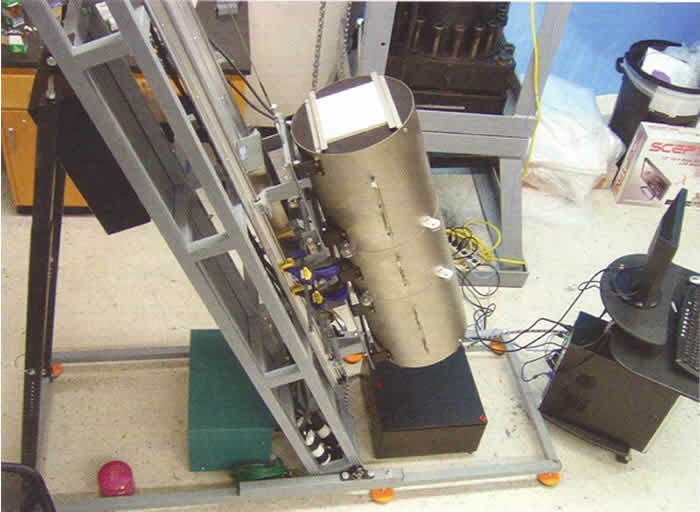 "We looked into various active and air table vibration handling systems, and eventually selected Negative-Stiffness vibration isolation," continues Harrison..
Vibration transmissibility with Negative-Stiffness is substantially improved over air systems, which can make vibration isolation problems worse since they have a resonant frequency that can match that of floor vibrations. 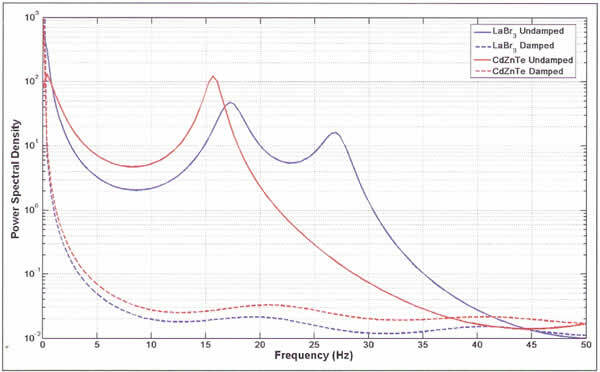 Transmissibility is a measure of the vibrations that transmit through the isolator relative to the input vibrations. The NSM isolators, when adjusted to 0.5Hz, achieve 93 percent isolation efficiency at 2Hz; 99 percent at 5Hz; and 99.7 percent at 10Hz. "One of the concerns we had was surface waves coming across the ground, which induced vibration in the crystal growth system," explains Harrison. "We are located in a basement," Harrison says. "Before we got the NSM system, I could actually see somebody walking down the stairs through the walls with a seismometer. With the Negative-Stiffness system in place, I can't even tell when they are shelling at the nearby Fort Riley military base.". Gamma ray detectors have been around for years, but they are either very low efficiency, poor performance or they require liquid nitrogen cooling, such as those employing germanium. Imagine the difficulty required to take liquid nitrogen into a remote desert searching for special nuclear material. "What we are trying to do at SMART Lab is make it more feasible, more economical for these detectors to be put in place at every critical check point, at every airport and shipping port," Harrison says. "This will increase the possibility of detecting and intercepting shipments of special nuclear material, should they occur." The SMART Laboratory serves as a centre for undergraduate and graduate student education, as well as a facility, to accommodate funded research projects from various government and industrial sponsors. Since the opening of the Laboratory in 1998, eleven patents have been awarded to SMART Laboratory researchers for various detector designs, with several more pending. The laboratory's equipment includes an assortment of semiconductor processing equipment, including a linear-drive diamond cutting wheel, diamond wire saw, precision slurry saw, wafer dicing saw, precision lapping and polishing machines, a custom chemo-mechanical polishing system, a custom six-pocket e-beam evaporator, a 4-pocket evaporator, two dual filament evaporators, an ion mill, vacuum annealing chamber, fission chamber plating station, mask aligners, microscopes, ovens, grinders and furnaces for annealing, sintering, diffusions and oxidations. The Lab has numerous crystal growth furnaces used to grow CdZnTe, LaBr3, and HgI2 crystals for radiation detector development, which include 40 horizontal and 10 vertical HgI2 vapour transport furnaces, two high pressure vertical Bridgman furnaces, two low pressure vertical Bridgman furnaces, three zone-melt furnaces, a vapor transport purifying furnace, and a GaAs LPE furnace. Central to SMART Laboratory is a Class-1000 cleanroom where radiation detectors are fabricated. The Laboratory is equipped with a scanning electron microscope, Auger electron analyzing system, IV and CV tracers, ellipsometer, probers, radiation sources and Nuclear Instrumentation Module (NIM) electronics to test and characterise radiation detectors and materials. * The atomic number which uniquely identifies a chemical element is represented by the symbol Z. Also known as the proton number, it is the number of protons found in the nucleus of an atom and identical to the charge number of the nucleus.